Endovascular repair of the thoracic aortic aneurysms (TEVAR) has broadened the available therapeutic options, allowing more patients to be definitively managed than was previously possible. This minimally invasive approach avoids thoracotomy and cross-clamp of the descending aorta with left heart bypass, and hence recovery is shorter, and short-term outcomes are improved. As technology has advanced, the number of patients that are anatomically suitable to be treated in this way has increased significantly. 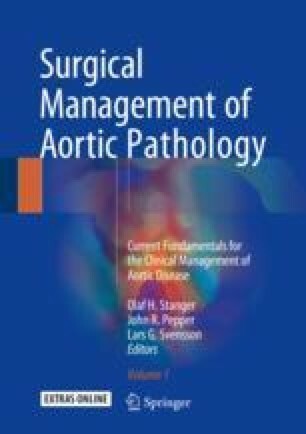 In the course of this chapter, we explore key issues in planning, placement of the stent and strategies to avoid complications from TEVAR. Avoiding potential complications through a better understanding of the pathology and the treatment is key to good outcomes.